JONESBORO, GA [May 24th, 2018] — Southern Crescent Habitat for Humanity (SCHFH) is participating in Habitat for Humanity’s annual Home Builders Blitz. Home Builders Blitz brings together pro­fessional homebuild­ers from all over for one shared pur­pose – to build safe and affordable housing for families in need of a decent place to call home. Potential Home Builders Blitz Donation Items include: Ceiling Repair, Door & Window Replacement, Electrical Repairs, Install Roofing Shingles, Install Walk-In Shower, New Gutters, New Kitchen Countertops & Sink, Plumbing Repairs, Pull Trusses and Sheath Roof, Replace Flooring, Service HVAC System. These items will be used to help 3 local homeowners: Slyvia Simmons, Louise Webb and Irene Haney. Sylvia Simmons lives in Fayetteville, Ga. She is a part of our critical home repair program and is 100% disabled. Unable to do any repairs and living on a fixed income Slyvia is in desperate need of repairs. Her original roof is over 30 years old, rodents and other pests are able to enter the home, and she is unable to use her kitchen sink and stove. Slyvia’s needs include: Ceiling Repair, Door & Window Replacement, New Gutters, Plumbing Repairs, Replace Flooring. Louise Webb also lives in Fayetteville, Ga. She is a part of our critical home repair program and lives with her disabled son. They are both physically unable to do necessary repairs and live on fixed incomes. Their bathroom is inaccessible with health and age restrictions, the electrical in the kitchen does not work properly, and all the windows in the home need to be replaced. Their many safety and accessibility needs include: Electrical Repairs, Install Walk-In Shower, New Kitchen Countertops and Sink, New Gutters, Service HVAC system. Irene Haney is a resident of Hampton, Ga. She is one of our newest homeowners whose house we have just begun. She has rented for over 30 years and is looking for a place to call her own. We are in need of contractors to help donate labor and or materials. Irene’s needs include: Installation of Roofing Shingles, Pull Trusses and Sheath Roof. For more information please contact development@schabitat.org or call Kiera Dunn at (770)-477-2367. Southern Crescent Habitat for Humanity is a nonprofit housing ministry that helps low-income families find opportunity, achieve stability, and improve their quality of life. SCHFH builds stronger families and neighborhoods by partnering with donors and volunteers to construct attractive and affordable homes, to repair existing homes, and to address community needs through neighborhood revitalization. Since its founding in 1986, SCHFH has built 200 homes and repaired 150 homes. ATLANTA (May 3, 2018) – For the 11th year, Habitat for Humanity and Lowe’s will host the annual National Women Build Week from May 5-13 where thousands of women volunteers and Habitat homeowners will unite nationwide to build up their communities and gain skills in home construction. National Women Build Week encourages women nationwide to devote at least one day to help build decent and affordable housing in their local communities. Women have the strength and determination necessary to build Habitat houses, addressing the problem of affordable housing in a concrete way so that families can achieve stability and independence through safe, decent and affordable homes. Nearly all women (98 percent) agree access to affordable housing helps women heads of household thrive. Having a safe, stable home is a source of pride (96 percent) that makes women feel more confident (98 percent) and independent (97 percent). Three-in-five (62 percent) women say they cannot afford to purchase a home that meets their family’s needs in the neighborhood where they want to live. Lowe’s and Habitat share the vision that every woman, man and child have a decent place to lay their heads at night. Far too often, low-income families are faced with choosing between paying their housing costs and buying necessities like food and medical care to provide for their family. National Women Build Week recruits, educates and inspires women to build, and advocate for decent and affordable houses in their communities alongside their future neighbors—making a difference in their community, one nail at a time. Lowe’s helped launch National Women Build Week in 2008 and has brought together more than 117,000 all-women construction volunteers to build or repair homes with nearly 5,000 families over the past 10 years. This year, Lowe’s donated $2 million to Habitat for Humanity to support the 2018 National Women Build Week, and provides how-to clinics at stores to help equip women volunteers for the builds. Since 2003, Lowe’s has committed over $30 million to Habitat for Humanity International and helped more than 6,500 Habitat families improve their living conditions. Both women and men of all experience levels can participate by signing up to volunteer with their local Habitat organization or by joining the conversation online. As part of National Women Build Week, Lowe’s and Habitat are activating a social movement to generate conversation about building one another up and sharing the message of women empowerment, positivity and action by using #BuildHer and #WomenBuild. Driven by the vision that everyone needs a decent place to live, Habitat for Humanity began in 1976 as a grassroots effort on a community farm in southern Georgia. The Christian housing organization has since grown to become a leading global nonprofit working in local communities across all 50 states in the U.S. and in more than 70 countries. Families and individuals in need of a hand up partner with Habitat for Humanity to build or improve a place they can call home. Habitat homeowners help build their own homes alongside volunteers and pay an affordable mortgage. Through financial support, volunteering or adding a voice to support affordable housing, everyone can help families achieve the strength, stability and self-reliance they need to build better lives for themselves. Through shelter, we empower. To learn more, visit habitat.org. Lowe’s, a FORTUNE® 50 home improvement company, has a 60-year legacy of supporting the communities it serves through programs that focus on K-12 public education and community improvement projects. In the past decade, Lowe’s and the Lowe’s Charitable and Educational Foundation together have contributed nearly $300 million to these efforts, and for more than two decades Lowe’s Heroes volunteers have donated their time to make our communities better places to live. For the latest news, visit Newsroom.Lowes.com or follow @LowesMedia on Twitter. The 2018 Lowe’s and Habitat for Humanity National Women Build Week Survey presents the findings of an online survey conducted by Toluna from April 5-8, 2018 among a random sample of 1,019 American women age 18+. The margin of error for a sample of this size is ± 3% at a 95% level of confidence. LOVEJOY, GA [April 22, 2018] – A team of over sixty volunteers from Wells Fargo joined together with Southern Crescent Habitat for Humanity (SCHFH) to build a home for a family in need in Lovejoy, GA.
Southern Crescent Habitat for Humanity is a nonprofit housing ministry that builds and repairs homes for low-income families in Clayton, Henry, and Fayette counties. New home builds are funded by grants, individual donations, and corporate partnerships. 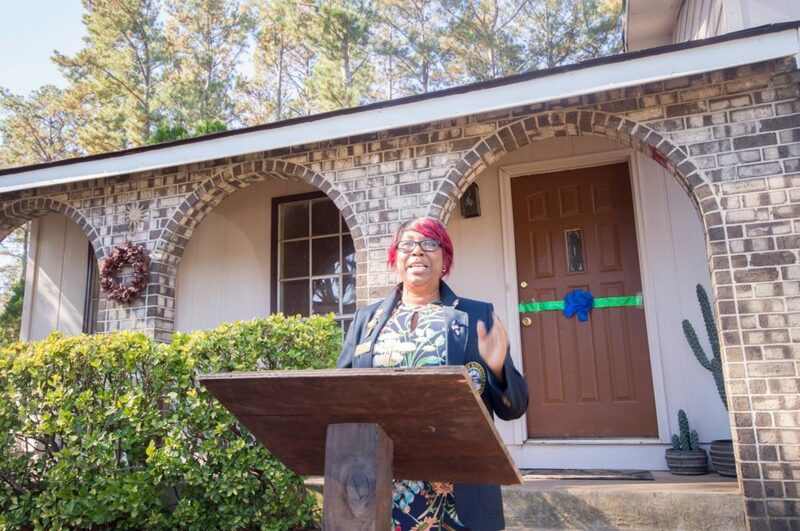 Wells Fargo donated $15,000 to the project and hundreds of volunteer hours to a new home build for Southern Crescent Habitat for Humanity partner family Ms. Toyea Casey. Volunteers put together the walls of Ms. Casey’s home, as well as painted the siding on another Habitat for Humanity home. This was part of a multi-state volunteer effort on Wells Fargo’s part for National Volunteer Month. Southern Crescent Habitat for Humanity is a nonprofit housing ministry that helps low-income families find opportunity, achieve stability, and improve their quality of life. SCHFH builds stronger families and neighborhoods by partnering with donors and volunteers to construct attractive and affordable homes, to repair existing homes, and to address community needs through neighborhood revitalization. Since its founding in 1986, SCHFH has built 200 homes and repaired 150 homes. Learn more at www.schabitat.org. Wells Fargo & Company (NYSE: WFC) is a diversified, community-based financial services company with $1.9 trillion in assets. Wells Fargo’s vision is to satisfy our customers’ financial needs and help them succeed financially. Founded in 1852 and headquartered in San Francisco, Wells Fargo provides banking, investments, mortgage, and consumer and commercial finance through 8,200 locations, 13,000 ATMs, the internet (wellsfargo.com) and mobile banking, and has offices in 42 countries and territories to support customers who conduct business in the global economy. With approximately 265,000 team members, Wells Fargo serves one in three households in the United States. Wells Fargo & Company was ranked No. 25 on Fortune’s 2017 rankings of America’s largest corporations. News, insights and perspectives from Wells Fargo are also available at Wells Fargo Stories. Lovejoy, GA [February 13, 2018] – Southern Crescent Habitat for Humanity (SCHFH), a local affiliate of Habitat for Humanity International, is launching its first ever Lent Build. Lent Build provides an opportunity for congregations to grow in their faith by giving back to support affordable housing. The public is invited to participate in this time of prayer, fellowship, construction, and fundraising between February 14th and March 29th in Fayette County, Clayton County and Henry County. 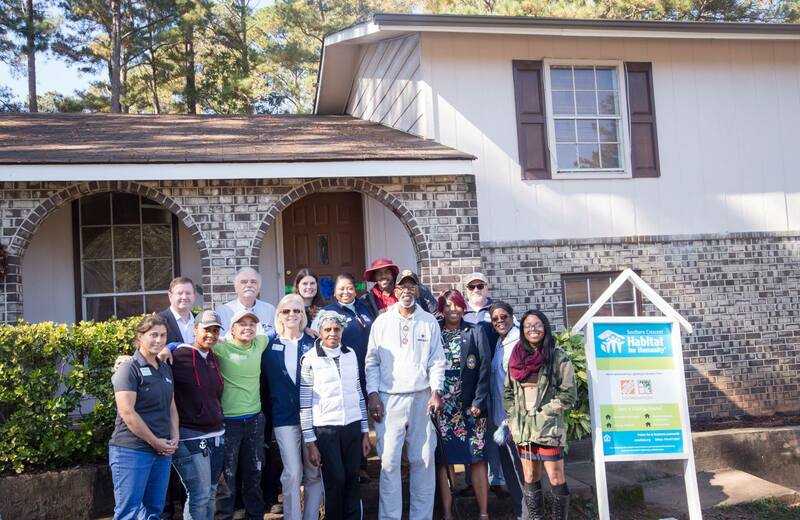 Since 1986, Southern Crescent Habitat for Humanity has been using volunteer-led construction to build, repair, and rehab affordable homes for low-income families in Clayton, Henry, and Fayette counties in South Metro Atlanta. Southern Crescent Habitat homes and neighborhoods are located in cities all around the area such as Forest Park, Riverdale, McDonough, College Park, and Jonesboro. Habitat homeowners make between 30% and 80% of the area median income. They must pay a monthly affordable mortgage and contribute 250 hours of “sweat equity” in the construction of Habitat homes, in addition to taking 50 hours of home maintenance and financial literacy courses so they are prepared to pay for and maintain their homes. To date, SCHFH has impacted the lives of 300 hardworking families with a hand-up, not a hand-out. To sign up and learn more, please visit www.schabitat.org/lentbuild, call the organization at 770.477.2367, or email Trisha Pintavorn at development@schabitat.org. Ms. Gloria Saussy, a senior living in Riverdale, needs your help today. Our Home Repair program requires about 48 “sweat equity” or volunteer hours for seniors in our home repair program. But Ms. Saussy has doubled her hours. She put in time by helping out at the Habitat office and at our outreach tables at community events. She loves the homeowner education and financial literacy classes she has taken with us, especially the Dave Ramsey Financial Peace University courses. As Ms. Saussy waits on our wait list, her home becomes more and more damaged by water from her leaking roof. A hole has opened up in her garage ceiling, and water stains have begun to spread into her living room. We are fundraising all month along for Ms. Saussy’s project, along with other senior homeowners in need. If you would like to give to help with Gloria’s repairs, please consider contributing at schabitat.org/gagivesday. http://www.schabitat.org/wp-content/uploads/2017/11/Capture.jpg 492 1587 SC Habitat http://www.schabitat.org/wp-content/uploads/2018/01/SCHabitat_LogoMain_Black.png SC Habitat2017-11-14 09:43:262018-01-31 11:28:40Ms. Gloria Saussy, a senior living in Riverdale, needs your help today. Can you help us repair the roof over her head? FAYETTEVILLE, GA [November 7, 2017] — Volicia Scott is one of a dozen senior homeowners currently in need of repairs on our Home Repair wait list. She has committed her entire life to serving others. Ten years ago, Ms. Scott bought her home in Fayetteville, Georgia. Over the years, she has fostered 15 children and adopted two kids: her special needs 8-year-old son (pictured) and her 15-year-old daughter who they had nowhere else to go. She now works with another nonprofit in tandem with the SNAP program and Grady Hospital to help homeless people with HIV/AIDs. When asked what defines her life, she says that “It’s about service. I’ll be 65 this year, and I think in the last 20 years I’ve really come full-circle in terms of being humble and serving.” Now, we hope to come together and give back to this lifelong giver by repairing her leaking roof, water damage, and damaged ductwork among other repairs. As Ms. Scott lingers on our waitlist, her home becomes more and more damaged by water from her leaking roof. We are fundraising all month along for her project, along with other senior homeowners in need. Please help us fund her project today with a donation. Click here to give today to repair homes and restore hope. GAgives, rooted in the Thanksgiving season, has raised more than $13.5 million in donations for nearly 2,700 Georgia nonprofits since 2012. Led by the Georgia Center for Nonprofits, the GAgives initiative maintains an online fundraising platform, GAgives.org, free to use for any registered 501c3 in the state; it also helps teach and mobilize everyone with a stake in the community – organizations, corporate sponsors, government agencies, media partners, and citizens – to raise awareness and support for nonprofits. http://www.schabitat.org/wp-content/uploads/2017/11/SCHFH_webbanner_GaGives17_Volicia.jpg 500 1920 SC Habitat http://www.schabitat.org/wp-content/uploads/2018/01/SCHabitat_LogoMain_Black.png SC Habitat2017-11-07 09:01:322018-01-11 16:18:09Can you help us repair the roof over her head? Georgia Gives on Giving Tuesday will happen this year on November 28th, 2017, the Tuesday following Thanksgiving. SCHFH is asking the South Metro Atlanta area community to come together to help low-to-moderate income seniors with home repairs in Fayette, Henry, and Clayton counties. Last year, SCHFH raised more than $7,000 towards building a home for a veteran in need. This year, SCHFH hopes to raise $10,000 for senior home repairs. All month long, Southern Crescent Habitat for Humanity will be highlighting the stories of the senior homeowners in need of repairs. One homeowner, Volicia Scott, is a senior living in Fayetteville, Georgia. Her home has damage from a leaking roof. She fostered kids throughout her life, and currently works with homeless people with HIV at a small nonprofit. As a senior, she adopted two of the children that she was fostering: a 15-year-old girl and an 8-year-old boy with special needs. “At this point, I’m not ahead of this house. Now, we’re having a lot of rain and I find that the roof is leaking. I would love to be able to leave [this house] to these children if I can, if it’s liveable,” says Ms. Scott. Another homeowner, Gloria Saussy, lives in Riverdale. She also has a leaking roof that has caused a hole to open up in her garage ceiling. She is a single mother of 3 and worked for 40 years as an office manager before having to retire due to disabilities. Perhaps most dire of all is the home of Gloria and Alvin Johnson, seniors living in Jonesboro, GA. The roof is leaking in multiple places, opening up a hole in their bedroom, causing their living room to sag. Mold has become a problem as well. The couple tries their best to keep their faith and hopes up: “At least we’re not under the bridge. That’s how we look at it. I just pray on it. If God sees it fit for us to have it, He’ll put it there,” says Mrs. Johnson. SCHFH hopes to raise $10,000 in order to help complete some of these repairs. “We know that $10,000 is a tall order, but we are confident that our community can come together and raise the funds needed,” said Cynthia E. Jenkins. The Georgia Center for Nonprofits builds thriving communities by helping nonprofits succeed. Through a powerful mix of advocacy, solutions for nonprofit effectiveness, and insight building tools, GCN provides nonprofits, board members and donors with the tools they need to strengthen organizations that make a difference on important causes throughout Georgia. Learn more at gcn.org. 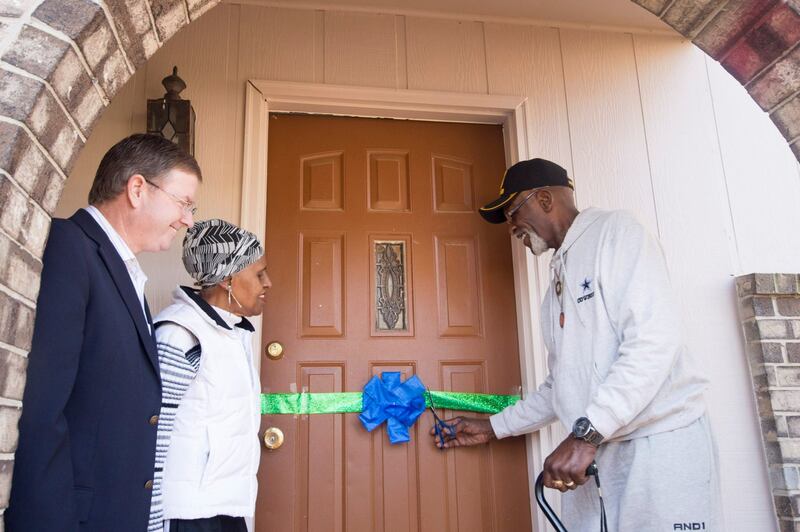 FAYETTE COUNTY, GA [October 27, 2017] —On Friday, October 27, 2017, Southern Crescent Habitat for Humanity (SCHFH) celebrated the completion of a bathroom installation and home repair for senior Fayette County citizen Walter Prayor. Mr. Prayor, 82, had been using an outhouse and bucket showers his entire life. Mayor Ed Johnson from the City of Fayetteville said a few words of welcome, and Pastor Stephen Palmer from the Church of the Harvest Fayetteville blessed the home at a small ceremony. Volunteers, SCHFH staff, SCHFH board members, and donors from the project were also in attendance. Mr. Prayor was referred to Southern Crescent Habitat for Humanity by his Meals on Wheels Coordinator, Marie Doyle, at Fayette Senior Services. In December of 2016, Ms. Doyle asked Mr. Prayor’s daughter, Francine Prayor, what her dad wanted for Christmas. She told her that he wanted a bathroom. Ms. Doyle then put Francine and Walter in touch with Southern Crescent Habitat for Humanity. Southern Crescent Habitat for Humanity was able to raise enough funds to complete the $25,000 repair. The project was funded by the following organizations: a GoFundMe campaign, a grant from a Coweta-Fayette EMC, a grant from the Wells Fargo Housing Foundation, a grant from the North Georgia Housing & Homeless Council, hundreds of volunteer hours, proceeds from the Pinewood Studios Winter Gala, and a donated septic tank system and labor from Terry Long’s Backhoe & Grading. SCHFH completed the bathroom installation with an ADA walk-in shower, as well as other home modifications including a small kitchen renovation and new exterior paint, in September 2017. “We’re so happy to have met Mr. Prayor, and along with many, many volunteers and donors, to have been able to affect change within his life. I know everyone was surprised when we heard that someone has an outhouse in 2017 [and thought] we’ve got to do something about this. And with your help, and with the skillset of people within our organization, we were able to give Mr. Prayor a bathroom. Mr. Prayor, we count it a privilege to have been able to do this for you,” said Ms. Cynthia E. Jenkins, Southern Crescent Habitat for Humanity CEO. Southern Crescent Habitat for Humanity will launch a fundraising campaign this November for senior homeowners living in Fayette, Clayton, and Henry Counties who are in need of home repairs, just like Mr. Prayor. If you would like to learn more or donate, please visit schabitat.org. If you know of a family in need of home repairs, please ask them to email SCHFH’s Family Services Coordinator Megan Hepker at megan.hepker@schabitat.org. View more photos from the project here. Southern Crescent Habitat for Humanity is a nonprofit housing ministry that helps low-income families find opportunity, achieve stability, and improve their quality of life. SCHFH builds stronger families and neighborhoods by partnering with donors and volunteers to construct attractive and affordable homes, to repair existing homes, and to address community needs through neighborhood revitalization. Since its founding in 1986, SCHFH has built 200 homes and repaired 150 homes in Clayton, Henry, & Fayette Counties. 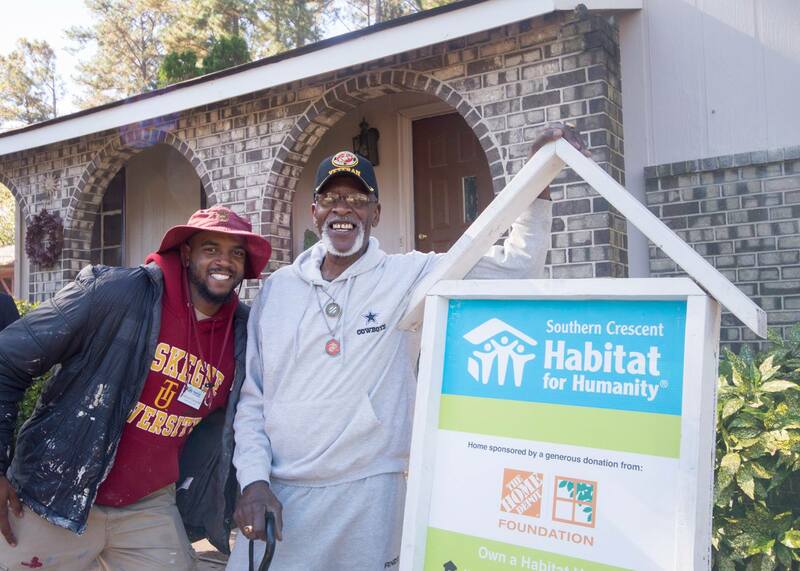 RIVERDALE, GA [November 14, 2017] —This past Veteran’s Day weekend, Southern Crescent Habitat for Humanity (SCHFH) celebrated the completion of its 150th Home Repair for Milton Williams. Milton is a Vietnam-era Army and Marine Corps veteran from Albany, Georgia. His wife, Angela Williams, is a Birmingham, Alabama native and retiree who has worked in the retail, warehouse, and banking industries. Milton met his wife Angela a little later in his life. They started dating after meeting at a seafood restaurant in 2003. His wife of 25 years had just passed away from ALS disease. Angela was a widower herself, as her husband passed away in 1986 when her son was just 10 months old, leaving her to raise him by herself. If you would like to give to help more families like the Williams family, please consider contributing at schabitat.org/gagivesday. The Home Depot Foundation, a registered 501(c)3 public charity, works to improve the homes and lives of U.S. military veterans and their families and respond to communities in disaster. Since 2011, The Home Depot Foundation has invested more than $138 million in veteran causes and transformed more than 25,000 homes for veterans. And their work is not done. In 2016, The Home Depot Foundation made a commitment to increase their investment in veteran causes to a quarter of a billion dollars by 2020. Southern Crescent Habitat for Humanity (SCHFH) will celebrate the completion of a home repair project for Mr. Walter Prayor of Fayetteville, Georgia. Mr. Prayor is a senior who has been using bucket showers and an outhouse his entire life. SCHFH recently completed a bathroom installation for him. Attendees will also have a chance to hear more about Walter’s story. WHEN: Friday, October 27, 2017 from 11 a.m. to 12 p.m.